“This iconic landmark, and the story it tells, is truly an authentic part of American history, and a treasure we want to share,” said Governor General George Garmany, GSMD. 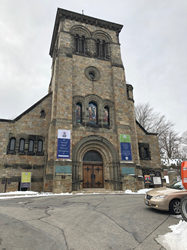 A historic 1897 Plymouth, MA church designed as a memorial to the Mayflower Pilgrims and built by famed architects Hartwell, Richardson & Driver is getting a new lease on life. Final papers were submitted to the Plymouth Registry of Deeds on Tuesday, February 19, 2019 making the General Society Mayflower Descendants (GSMD) sole owner of the former First Parish Church of Plymouth. To save their beloved building, the First Parish Church congregation donated the Meetinghouse to GSMD. The society will make it an education center to tell the Mayflower story. It is operated by the National Pilgrim Memorial Meetinghouse Charitable Trust, an entity of GSMD. Over a million people are expected to visit Plymouth during 2020, the 400th anniversary of the Mayflower voyage. Today, there are over 10 million Americans who descend from the Mayflower Pilgrims and over 35 million worldwide.